Dr. Il Sik Hong, chairman of the Sunhak Peace Prize Committee opened the session by expressing his sincere admiration of the laureates, emphasizing that peace can be achieved only when everyone’s human rights can be protected and respected. Dr. Hong proudly expressed that this year’s laureates have dedicated their lives to protecting the most vulnerable people in Africa and the world. Laureate Dr. Akinwumi Adesina, president of the African Development Bank, has promoted a vision of good governance for African nations. He has implemented innovative agricultural and anticorruption policies in Nigeria and all across Africa. Laureate Waris Dirie has improved the rights of millions of girls and women by leading a campaign to eradicate the tragic act of female genital mutilation. Moving video presentations were played to a captive audience highlighting the achievements and visions of the recipients. 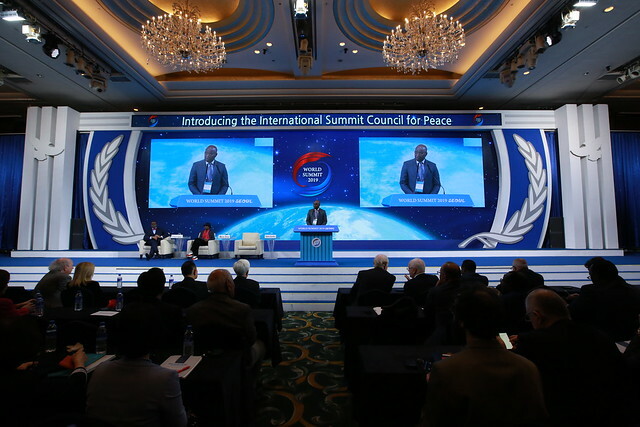 Dr. Adesina started his acceptance speech by commending the founder, Dr. Hak Ja Han Moon, for setting up the Sunhak Peace Prize to underscore her work to make the world a better place. The ideal that Sunhak stands for, he said, is a world where we live in peace with one another, is not only the decent thing to do—it is a moral imperative. Ms. Waris Dirie, Somali-born human rights activist against female genital mutilation, opened with her very first childhood memory. It was of violence against her mother. The instinct that there was no good in what she saw put her on the quest for peace. In the family, between neighbors, friends, nations and the world, she explained, the problems of female genital mutilation and all other injustices are issues of respect: “Everyone deserves respect from each other. We don’t learn that lesson from the recurring history of violence and abuse. Mother nature is sick, people are greedy; we hurt each other. All have the same root cause.” Ms. Dirie called on the audience to leave a better world for future generations, which we can accomplish through understanding, respect and acceptance. Ambassador Kenneth M. Quinn, president of the World Food Prize Foundation, gave a congratulatory message. As the second decade of the 21st century draws to a close, it is clear, he said, that the single greatest challenge that the human species has ever confronted is to nutritiously and sustainably feed the 9 to 10 billion people who will be on Earth by the year 2050, especially given the impact of climate change and global events. To finish the session, First Lady Moallim congratulated the Sunhak Peace Prize Foundation on awarding individuals and organizations that live for the sake of others and for the benefit of future generations. She observed that this is the vision of Reverend and Dr. Moon, whose ideals are embodied in this prize. This prize, he said, is a great and glorious way to uplift the best qualities of humanity. The program ended with an uplifting collaboration of entertainment that featured peace-themed dances by the Expression Crew, singing by Sohyun Kim and Joon-ho Son, and the finale with The Little Angels in “Circle of Life.” For more information about the Sunhak Peace Prize and this year’s laureates, please visit sunhakpeaceprize.org.